Amnesty International: Fewer Executions But More Death Sentences In 2016 : The Two-Way Amnesty estimates China killed more people than all the other countries put together. The U.S. fell off the list of the top five countries to carry out the death penalty for the first time since 2006. Alabama's lethal injection chamber in 2002 at Holman Correctional Facility in Atmore, Ala.
Amnesty International says there were fewer executions worldwide last year than the year before — but the number of death sentences handed down is the highest it has ever recorded. In its annual report, Amnesty estimates that China carried out more executions than all the other countries put together. The human rights group says China put thousands of people to death. The exact figure is classified as a state secret and is not included in Amnesty's worldwide total. Four other countries — Iran, Saudi Arabia, Iraq and Pakistan — carried out 87 percent of the remaining executions. "Just a handful of countries are still executing people on a large scale. The majority of states no longer condone the state taking human life. With just four countries responsible for 87 percent of all recorded executions — the death penalty is itself living on borrowed time," Amnesty Secretary-General Salil Shetty said in a statement. Worldwide, at least 1,032 people were put to death last year, not counting those killed in China. That's a 37 percent drop from 2015. Amnesty also says that "3,117 people were sentenced to death in 55 countries for 2016," surpassing Amnesty's peak number of 2,466 people sentenced in 2014. For the first time since 2006, the United States was not in the top five countries to carry out executions, Amnesty said. "Use of the death penalty in the USA is at its lowest since the early 1990s. But we have to fight to keep it that way," Shetty added. 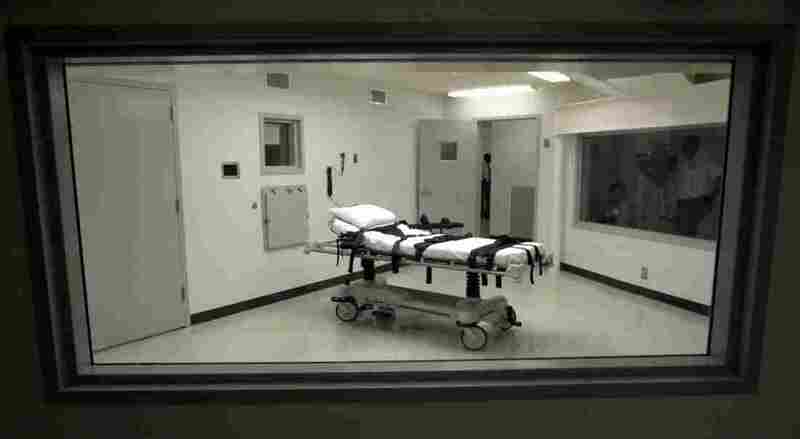 That could change this year, Shetty adds: "The shocking number of executions scheduled over a ten-day period in Arkansas this April is a clear example of how quickly the picture can change." Seven people are currently scheduled to be put to death there later this month. The U.S. carried out 20 executions in 2016 — eight fewer than the previous year. Amnesty said in its report that the decrease is "linked to legal challenges that resulted in the revision of lethal injection protocols or problems faced by states in obtaining lethal injection chemicals." For the eighth year in a row, the U.S. was "the only country to carry out executions in the Americas region." Amnesty argued that the death penalty should be abolished worldwide. It applauded two countries that completely abolished the practice in 2016: Benin and Nauru. As The Two-Way has reported, "the death penalty has become historically unpopular among American voters and its use is also becoming increasingly rare."